What is a Good Thermometer for HVAC? Taking temperature readings is part of a HVAC technicians job from reading air differences at the supply and return, to reading super heat and sub cooling. 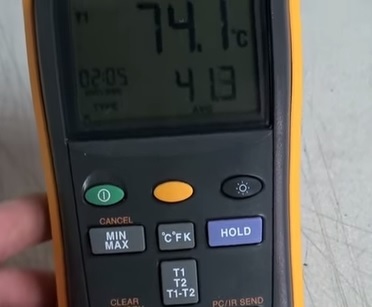 So what makes for a good HVAC thermometer? This really depends on the job. For example pocket thermometers are a great tool to carry around and get general readings, such as checking your Delta T, comfort calls, outside air temp, etc. They do have some degree of error but give a general reading that can point you in the right direction. Infrared thermometers are good in theory but don’t live up to the hype that surrounds them. This may change from brand to brand as to accuracy. Infrared thermometer also give a general reading and are good in some cases. For example a return air that is high up. Infrared thermometer don’t work well with copper lines which scatters the infrared sensor. Again manufactures may have some good ones out there (I haven’t tested them all) but in my experience infrared is only good to get generalized readings. The best most accurate reading you can get is with a digital HVAC thermometer. The leads built into many HVAC meters such as Fieldpiece HS33 are good multi purpose temperature measuring equipment. Dedicated digital thermometers with sensor probes are also a good tool to use. Last but not least is the durability of the thermometer which must hold up to all kinds of abuse that HVAC technician will put it through. Remember each tool has its own place and often 2-3 types of thermometers are used depending on the situation. As always be sure to read reviews on Amazon, Forums, or elsewhere to be sure a unit is a good fit for you. 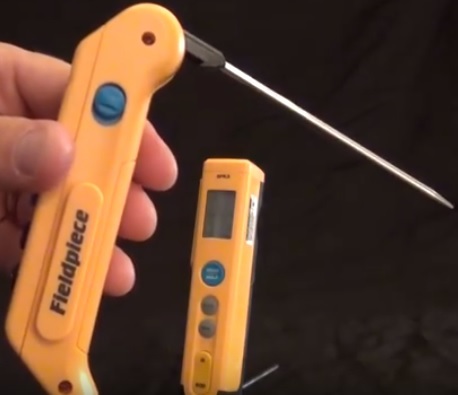 Fieldpiece makes the SPK2 sturdy pocket thermometers for HVAC were the probe bends to fit into a pocket. It is a little to heavy for a shirt pocket but slides easy into a pant pocket. It has a magnet that attaches to duct work that comes in handy along with a diplay that lights up when needed. It takes around a minute for it to get a good reading but is a good low-cost reliable unit that works. This is a good thermometer to get quick general temperature readings. This unit is a digital thermometer that comes with sensor probes to get more accurate readings. It is a budget unit that is built more for home use or the part time HVAC tech but does work and low-cost. It is built for a professional HVAC tech who will be using a thermometer a lot. The unit comes with many attachments such as clamps, one for the suction line and one for the liquid. The Fluke 561 HVAC Pro is an Infrared Thermometer made for the professional. If you are looking to get temperature reads at a distance this is a good one to have. It is a good unit to see what the temperature is coming out of vents up high or low without having to get a ladder out or constantly be kneeing down. The REED SD-947 is another professional HVAC thermometer with many nice features. It has a temperature range from -148 to 2372 Fahrenheit and very accurate with at +/-0.4%. The display can show up to four temperature results at the same time which comes in handy in a variety of scenarios. A very nice feature is the real time data logger which the the data held on a SD-card and can be taken out saved and copied. Temperature measuring instruments measure the temperature of vapors, liquids, and solids. 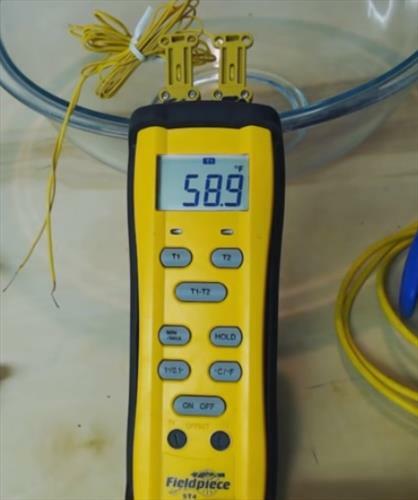 Air, water, and refrigerant in copper lines are the common substances measure for temperature level regardless of the medium to be measured the methods for checking the accuracy of the instruments are similar. Refrigeration technicians must have thermometers that are accurate from -50°F 50°F to measure the refrigeration lines and the inside coolers higher temperatures are experience when measuring ambient temperatures, such as when the operating pressures for the condenser are being examined heating and air conditioning technicians must measure air temperatures from 40°F 250°F and water temperatures as high as 220°F for normal service. This can require a wide range of instruments for temperatures above 250°F for example, flue gas analysis in the gas and oil burning equipment, special thermometers are used. In the past most technicians relied on glass then Mercury or alcohol thermometers. New electronic digital thermometers are what is used now and gives the most accurate reading. Digital thermometers are simple economical and good at taking measurements although the digital instrument cost more they can retains accuracy for longer times. 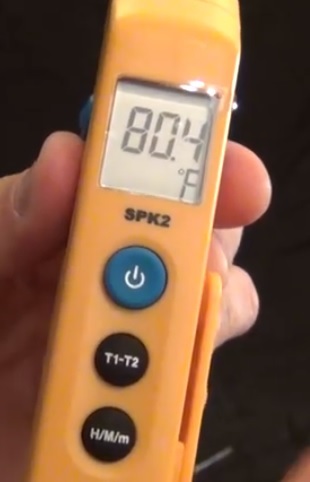 Pocket type thermometers are often used in a pinch for taking quick a quick measurement but are not as accurate as sensor probes built into digital. Accuracy is more important the lower temperature goes. Where small temperature differences are measured. A 1°F air does not sound like much until you have one degree that is off plus or -1°F and try to take an accurate temperature drop across the water heat exchanger that only has a drop of 10°F. You will have a Built-in 20% degree of error. *This post contains affiliate links to products on Amazon. What Size Mini Split Do You Need? What is the Best Ways To Heat a Garage? What Is the Best Way to Heat and Cool a Mobile Home? What Is the Biggest Largest Window Air Conditioning Units? What Is the Easiest Mini Split DIY Kit to Install for a Homeowner? What Is a Mini Split Heat Pump Air Conditioner? What is the Best Mini Split Heat Pump for a Tiny House? What is the Smallest Window Air Conditioner? What is the Best Heater for a Basement? Do not attempt any HVAC furnace repair, air conditioning repair, heat pump repair, wiring, HVAC installations or other HVAC repairs without the proper training. HVAC systems can be dangerous and lead to injury if proper safety procedures are not taking. The tutorials on hvachowto.com are meant for qualified HVAC technicians. All HVAC refrigerants require by law a EPA 608 card to work with.